Next weekend, elite cyclists from around the world will race in Yorkshire in the Grand Depart of the Tour de France. No matter how hard they strain, it's doubtful any will put in more effort on a bike than Mr Robertson, of Galashiels. 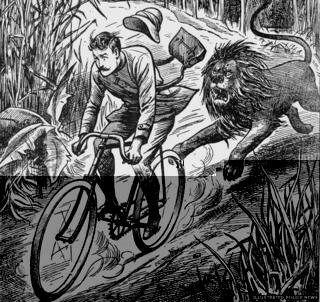 Author Jeremy Clay tells the story of the cyclist chased by a lion. There were upsides and downsides to the day Mr DC Robertson decided to go for a spin on his bike in the countryside. Let's start with the plus points. He had a good run out. He got plenty of fresh air. He saw a splendid sunset. And he had an invigorating cardiovascular workout too, although that brings us neatly to the main minus - that he was chased relentlessly for two miles by a ravenous lion. It was an August afternoon in 1898 when the Scotsman took a ride through the Malawian bush from the town of Blantyre back to his coffee plantation. As the sun slipped down below the horizon, he turned from the main road, and joined the lane to the estate. The track had just been laid, he later recounted, and was still soft and rather lumpy, as well as being punishingly steep. These things, it would soon turn out, would become problematic. Wearied by the slope, Mr Robertson dismounted and began pushing his bike instead. That's when he heard it. A powerful creature pounding its way through the undergrowth nearby. "I thought it was some big game, possibly an eland or buffalo," he later told the British Central Africa Gazette, "but as I felt a certain amount of uneasiness I went to the other side of the road, and pushed away as quickly as I could." A few yards further along, he took a glance behind. There, in the moonlit road, was a fully-grown lion. "I almost had a fit when I saw it," he said, his Victorian stiff upper lip fleetingly wobbling like blancmange in a centrifuge. For a moment, man faced beast and beast faced man. Then the lion remembered it was peckish, and charged. "I attempted to mount my machine, but, owing to the slope and my excitement, I failed twice," said Mr Robertson. "The third time I succeeded in getting away, and I did pedal for all I was worth." Off he rode like a man possessed, every sinew straining to coax the most speed from his rickety bike. But when he risked another look, the Galashiels man was perturbed to see that not only was the lion still in pursuit. Not only that, but the gap between them had been halved. And he still had 50 yards to go before reaching the brow of the hill. "He kept up a low growling all the time, and I could hear him more and more distinctly as he still lessened the distance between us. "I think I could easily have outstripped him if it had been level, but the machine kept up a rattle, rattle, over the inequalities in the road, and once or twice I was almost thrown off." At the point when the lion was almost close enough to leap and dine on raw Scotsman, Mr Robertson made it to the crest of the hill and got a kindly kick from gravity. As he tore down the far slope, quite possibly breaking several cycling records along the way, he remembered a short cut - an open culvert up ahead. "There was no time to dismount, so I rode into it, and the shock flung me high out of the saddle, but I fell back on it without being knocked off." It was the kind of stunt performed by men who call each other "dude". Mr Robertson survived unscathed, but the same couldn't be said for his bike. The front fork was twisted. The front wheel grated against it. "But it was not quite jammed, and I was able to ride on. When I reached the smooth part of the road near my plantation I was able to get up a good rate of speed." Better still, he realised, that the blood-curdling growl had faded away to silence. Whether exhausted or bored, the lion was nowhere to be seen. Mr Robertson was safe. The Edinburgh Evening News later called it "one of the most extraordinary adventures that has ever fallen to the lot of a European." The Illustrated Police News billed the story as a Mad Ride For Life. To the understated Cheltenham Chronicle, it was a "somewhat unusual experience". As for Mr Robertson, he'd learned his lesson. "No more moonlight rides for me," he vowed.